Carat is a term used to express the overall weight of a diamond or gemstone. One carat always equals 200 milligrams (1/5 grams) of actual weight. Diamond carat is one of the "Four Cs" used to determine the overall quality and value of the stone. Since carat is one of the leading terms used when selling gemstones, it's important to understand the difference between carat weight and size. Not all 1-carat stones are equal. The abbreviation ct is a shortened way to write carat and refers to the weight of a single diamond or gemstone. 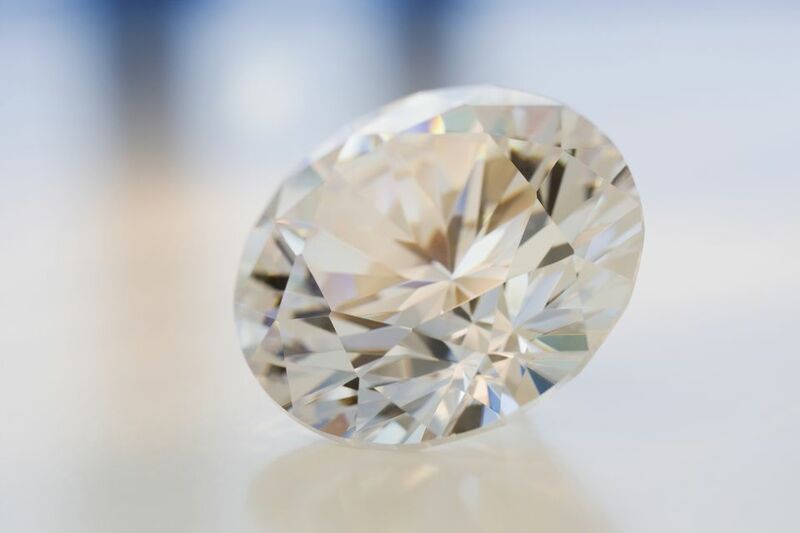 The abbreviation ct TW or ctw means carat total weight and is used to express the total weight of multiple diamonds or gemstones used in a piece of jewelry. A 1-carat diamond will look dramatically different in size than a 1-carat opal. This is because each gemstone has a different density. A smaller looking 1-carat stone is able to pack more weight into a smaller space. Even diamonds that have the same density and carat weight can look different in size. There are diagrams that illustrate a projected diameter of a diamond based on carat weight, but these aren't always 100% accurate. Diamonds of the same carat weight can look larger or smaller because of variations in shape and cut. These factors, like a shallow cut, make stones with the same density look different in size. Expert Tip: If you want to save some money on a diamond without sacrificing on size, opt for a shallow diamond that weighs slightly less than 1-carat. Choose a stone that is only slightly more shallow than other stones. If a stone is too shallow, the light won't reflect optimally. A slightly shallower stone will have a larger diameter and will make the smaller stone look like a 1-carat stone or larger. Smaller diamonds that weigh less than 1-carat are often expressed in terms of points instead of carats. There are 100 points in a carat. Another way to look at it is to say that each point equals 0.01, or one-hundredth, of a carat. 0.05 means five one-hundredths, so a 0.05-carat diamond equals five points. 0.25 means twenty-five one-hundredths, so a 0.25-carat diamond equals twenty-five points or one-quarter of a carat. Larger diamonds are rarer and in more demand than smaller diamonds of the same quality. A 1-carat diamond solitaire ring is always more expensive than a diamond ring made up of multiple smaller diamonds even though the carat weight totals one carat or more. "...try to find a diamond that weighs 90-points (9/10ths carat), rather than a full 1-carat, or 1.90 carats rather than a full 2-carats, and so on. When set, no one can see the difference, but you'll enjoy a big savings in cost." Diamond comparisons are useless unless they're made between diamonds with similar qualities and features. Considering the price per carat is a good way to compare the costs of similar diamonds. Divide the cost of each stone by its carat weight to calculate its price per carat. A diamond weight estimator, a sheet with cutouts for different diamond shapes and sizes, can help give you a preview of how a diamond's size relates to its carat weight. Remember, this is only an estimate and there will be variation between stones. Carat weight is only one diamond characteristic that you should explore before you buy a diamond. Take some time to understand more diamond basics before you go shopping. What's a D Grade Diamond? Has Your Diamond Been Color Enhanced? Is Your Diamond Real or Fake? What is an Ashoka Cut Diamond?